Refining devices play important roles in the process of pulp making. Leizhan compact structure refiners are used for beating and improving breaking degree of pulp to meet the paper making needs. Double disc refiner and claflin refiner works in series to provide fine paper pulp product for paper mill. 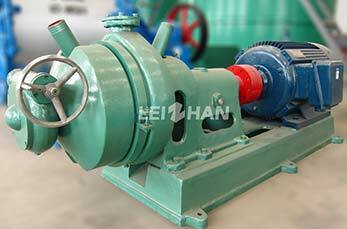 It is an ideal paper machine used for continuous pulping. 1. Compact structure, minimal space required. 2. High efficiency, low consumption. 3. Easy to install and maintain. 4. Suitable for various raw materials. 1. Clean the equipment regularly to keep it tidy. 2. Each antifriction bearing should be greased once every three months. Check the grease( lubricating grease) renewing one time every six months. 3. The sliding surface between shifting-seat and cover should be greased(lubricating grease) once every week and checked the oil renewing one time every three months. 4. Trapezoidal screw should be greased one time every three months and renew the oil one time every year. 5. Bearing block should be oiled one time every day to keep sliding sleeve working well, and clean and oil one time every three months. 6. Check whether the axial movement of the turntable is flexible. When it is load over and the feed is not flexible, check whether the outer diameter of the coupling studs is pit and wear,and make promptly replaced. 7. Check if there is foreign matter and gear grinding, when the gear grinding wear reach to or less than 1.5mm, the disc need to be replaced.